Decreased splenic erythropoiesis in Rnh1+/– adult mice. (A and B) Flow cytometry analysis for erythroid cells of 8-week-old Rnh1+/– and Rnh1+/+ mouse BM (n = 6 mice). (C and D) Flow cytometry analysis for erythroid cells of 8-week-old Rnh1+/– and Rnh1+/+ mouse spleens (n = 6 mice). Different erythroblast subpopulations were selected and are indicated as I to IV. I, proerythroblasts, II, basophilic erythroblasts; III, late basophilic and chromatophilic erythroblasts; IV, orthochromatophilic erythroblasts. Data are shown as mean ± SD. 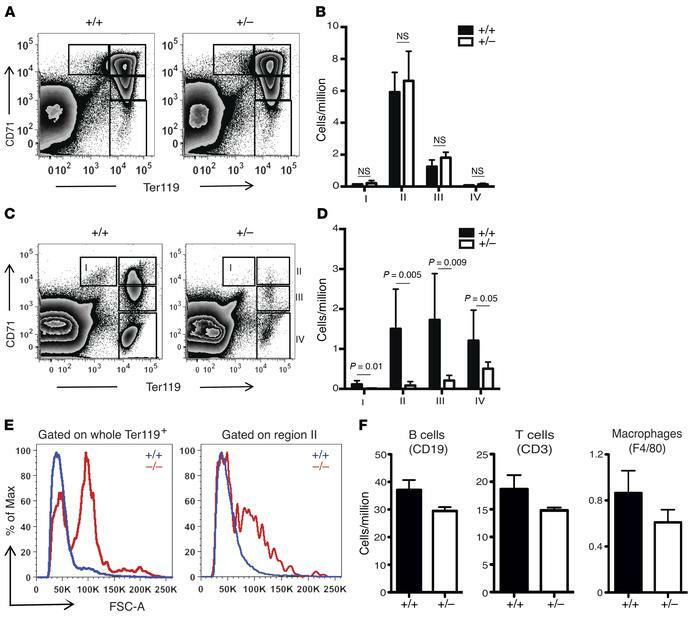 (E) Flow cytometry forward-scatter distribution histograms of Rnh1+/– and Rnh1+/+ mouse spleen erythroid cells gated on total Ter119+ cells (left) and on region II (right). Data are shown as mean ± SD. (F) Flow cytometry analysis for lymphoid and myeloid populations on 8-week-old Rnh1+/– and Rnh1+/+ mouse spleen B cells, T cells, and macrophages (n = 6 mice). FSC-A, forward scatter area. Data are shown as mean ± SEM. P values were determined by 2-tailed t test.